Sciatica is the common name given to a type of low back pain that refers pain down the leg. Sciatica is named after the sciatic nerve, one of the bigger nerves that travels through the buttock and down the back of the leg, which is the common area of pain for people suffering sciatica. Sciatica is a type of referred pain resulting from irritation of one of the nerve roots in the lower back. It is only the very start of the nerve that is irritated, but our brains feel the pain down part of, and/or, the full length of the nerve. Sciatica pain is described as “sharp”, “shooting” pain in a relatively narrow band down the leg. We call this referred pain, a "radicular pain" because it radiates down the leg. 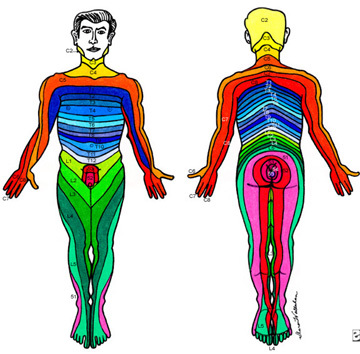 The area of pain can be mapped out to an area of skin supplied by the irritated nerve, which is called a dermatome. We can work out which nerve root is irritated based on the dermatomal map. Pain is usually aggravated by sitting, bending, lifting, coughing, or sneezing. Sciatica pain may start in the back and travel through the buttock and down the leg, or it may be in the leg only. There may be accompanying neurological symptoms such as pins and needles, numbness, or muscle weakness. It's possible to have neurological symptoms without any pain. Sciatica can be caused from an injury to an intervertebral disc. The discs are soft and squishy on the inside, a bit like toothpaste, and tough and leathery on the outside. One type of disc injury can be described as a "bulge". I use a meat pie analogy to describe the discs. If you squashed a meat pie, the pastry can bulge. Worse than a bulge, the pastry can crack and the gravy can ooze out. We call this type of disc injury an extrusion. The extruded disc material may physically press on the nerve root, causing irritation, or there may be chemical irritation from the inflammation and swelling. The extruded disc material is re-absorbed with time, relieving pressure from the nerve. This leaves a disc that is dried out or "desiccated". In most cases the pain improves spontaneously with time and does not require any special intervention. It’s important to closely monitor the progression of the symptoms. The further down the leg you feel the pain, the worse you are. As you improve, the pain will move up into the buttock or lower back. It’s important to be alert to the potential progression of neurological symptoms. As the irritation of the nerve root worsens, pain can progress to pins-and-needles, which can progress to numbness, which can progress to weakness in the muscles. Worsening neurological symptoms is a reason to seek further investigation such as an MRI. Neurological symptoms that progress to weakness in the leg is a reason to consider surgery. Bladder or bowel disfunction, such as retention or incontinence, is a reason to seek emergency medical intervention.